Specializing in Thai seafood and vegetarian dishes, Thai Ping was named “The Best Thai Food in New Jersey” by the Star-Ledger. 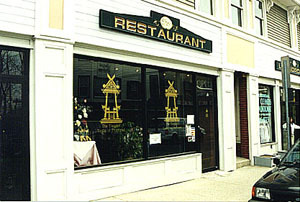 We are very proud to present our authentic Thai food to the people of Boonton, New Jersey and all travelers who seek fine dining. Thai Ping is the name of a river in Northern Thailand. That region is characterized by beautiful forests and wilderness. Once you step into the restaurant, you are no longer in Boonton, New Jersey, but in a Thai house in Northern Thailand where you will be served the most authentic Thai food you’ll ever taste! Thai Ping is a smoke-free restaurant.